Today the boys got about a year's worth of their normal television diet, all in one sitting. Mike went to work but the boys had the day off school, and I'm nowhere near 100%. Disney Channel to the rescue! We had rain most of the day with plenty of wind. At one point it started hailing, a phenomenon the kids have never seen. They were jumping around and yelling with great joy about the rocks falling from the sky, all from the comfort of our warm living room. 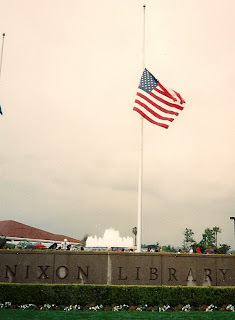 It brought me back to 1994 when my friend Michael Richards and I drove to the Nixon Library in Yorba Linda and waited in line for seven or eight hours for the public viewing of the late President Nixon's casket. Normally it would have been a memorable way to spend the day with an awesome friend, but it was pouring icy cold rain and giant chunks of hail the entire time we waited. Outside. Without an umbrella. In a wool coat (me) and a flannel shirt (him). I tried to explain the experience to the boys about how cold and miserable it was, but they just thought it was completely cool. My poor native Californian boys, who have only experienced the California sunshine or the subtropical warmth of Japan and Hong Kong. They are so sheltered! The weather made it all the more memorable. We were soaked to the core. What a crazy day that was.